When all else fails on Big Brother 2014, go out and form another alliance and that is what happened last night on the Big Brother Live Feeds! Which Big Brother 16 HouseGuests are “working together” this time? I’ll explain more in our Big Brother 2014 spoilers below, but are any of them truly working together when they each have about five alliances going? >>>Click here for our Live Recap of Big Brother 2014 tonight!!! For the day, Devin did some campaigning and no one was buying it. He tried to convince Donny, Jocasta and Brittany that they are the outsiders and need to work together against the big alliance. It is true, but no one seems to care about that and everyone wants Devin out. He tried to work it with Derrick and Derrick claimed he didn’t have that much power and has no vote. It looks like Devin is a goner, but Caleb could blow it up too! Why? Well, Cody and Amber spent a lot of time in the hammock together and Caleb creepily watched from the other side of the backyard! Amber talked about not ever giving Caleb a sign that she was into him and wanting to tell Caleb nothing would ever happen between the two of them. She was talked off the ledge, but that talk could send Caleb over the ledge. He doesn’t get why she is not into him with all that he has done for her. Hey Caleb, you are playing Big Brother 2014. Care only about yourself and you could possibly go far in the game! Brittany is trying to work all sides of the Big Brother 2014 house, so no one truly trusts her. Christine and Nicole talk about voting for Caleb this week. They think it would make a 9-2 vote instead of 11-0 and then blame the votes on Donny and Jocasta and put a bigger target on them. This could bring on a good entertainment value for us and see who believes who! So, Devin is going home. Caleb is ready to explode. Everyone likes alliances. Victoria probably will go next week, but the HoH winners will be a big determining factor. And Frankie does a lot of voices/impressions. In the first week everyone said this group was slow and nothing was going on. We have now made up for the first week and then some. These people are great. There is more alliance action this year than the past couple of years combined. I think production is either putting something in the water or not providing the anti-anxiety meds for the HG. Does Victoria do anything besides lay in the HOH bed and eat and lay in the hammock and bat her eyes. Her and Zach last night was killing me. I can only imagine Jon. I thing next week it will be either Victoria or Caleb headed home This week Devin is gone. No she did not. Sorry read the time in the hammock together wrong. Either way it is going to get interesting. Can’t wait!!! I can not either, now that will be entertainment. Finally a new picture – I was getting sick of looking at Frankie. Thanks Todd! “The Detonators”??…. Oh come on! So this is pretty much a mini BS. They’re still trying to blow things up and take down the rest of the house. They may or may not do that but i suspect a couple of them will blow their own foot off before they get to the end. Zach to be exact. I’m not sure what his strategy is other than to talk faster than any other hg. I see Derrick and Cody making F2 if they can keep their heads straight. We will see. I would love to see Nicole and Donny in the finale, but who knows at this point, they are all over the place. And I can see Derrick and Cody doing well, if they can keep it together the whole time and Cody cannot let Amber get to him! I think once Caleb is gone, Cody could get wrapped up in her! What is so great about Amber? 😛 Boo! When you find out…tell me.. because i’m wondering also. So, yeah, I guess she’s pretty… but not any more than any other girl in the house. Yeah, her eyes are kind of neat…. so? She has a nice body… but not any better than any other girl in the house…. And her personality isn’t anything super sweet or wonderful. I just don’t get it. Actually i think McCrae was too scared to tell her no. It would also require too much effort on his part. You are so right–she might have stopped bathing and gone off on a tirade, yelling and knocking on doors and being generally obnoxious….oh wait, she did that anyway, didn’t she! LOL,Too funny Tessa!! too funny! Yep, I think you definitely hit the nail on the head there! Ouch–that might not have been the best choice of words there but then again…. Speaking as a male fan. Amber is very attractive. I think Brittney (hair down) is the most attractive in the house. I could see why the guys are falling over Amber as she is (IMO) a very close 2nd. She is very timid around Alpha males she seems to be very passive when dealing with Caleb and Devin. It will be interesting to she how she acts with the other guys after they are gone. I think her timidiness is what makes her second in my book as I see independance and confidence in women very attractive and I kinda saw that in Brit when she was the target in week two. She saw what she had to do (make a deal with the devil) to stay. She found common ground and did what she had too to survive. Is she a good player, not really but at least she showed some determination. Yea, Jon, I’m not male but you’d have to be a blind monk NOT to notice Amber and Brittany walking around all day in those bikinis!! Ha! I expect this is not the first time Caleb has gone overboard concerning girls. I don’t believe it is Amber per say. It could have been Nicole or anybody. The fact is he is fixated on her and he can’t see anything else. That is what stalkers do. I agree Cat, maybe we will all get lucky and finally see a nice guy win. Kesha, those are my 2 favs also–I don’t get live feeds so I may have missed some important info about him, but I also like Hayden. I’ll be honest, I think Hayden is a really nice, decent guy. But he’s started to wear thin on me because he is extraordinarily immature. He’s like the little brother in the house: he’s cute at first, but starts to get a little annoying after a while. Not sure if the other hgs see it that way (though, honestly, I think Nicole does). Well, I am old enough that I could see myself being his grannie–actually, I think it would be more like his great-grannie. OK, I will just come right out and admit that today is my birthday and I am entering a new decade and it is OLD! Seriously old! But I had always heard that inside we always feel like we’re 18 and, to all of you young whippersnappers on the board, it really is true. Now get off my lawn!!! Lilly, The very best to your husband on his birthday tomorrow. Love that last sentence! Yes, one thing I am definitely planning is to give myself a couple of new knees pretty soon–I have worn the old ones out, LOL! Actually most of the damage is due to an accident but the age of the joints doesn’t help. Many happy returns Tessa 🙂 Getting old is a wonderful thing, better than the alternative right? Yes Happy Birthday, you are only as old as you fee Tessa. Honestly some of them in that house could not keep up with us older folks. We could run circles around them all. A very Happy Birthday, Tessa!!! ♥♥♥♥♥. Thanks, Joyce! And like Mary said, getting older is preferably to the alternative (at least so far it is!). If they start working together maybe they will get more out of the house. Hoping your a Blue and gold fan and not a State fan? If I have to choose I’m a State fan…. only 20 minutes from East Lansing. 😉 But I don’t really watch much football. The basketball is good in green and white. Where in Michigan? I am from there too! Hey, I’ve been South most of my adult life (which is now more than half my life), but I was raised in Michigan! About 18 miles north of Detroit. Lived in the Detroit area from age 7 to 20 (with an 18-month stink in Arizona in 6-7th grade). Any of you live near Ypsilanti? I have a brother that lives there. Grand Ledge 🙂 Just west of Lansing. How about you? Yep, and that would be Derrick and Cody. Just hope they don’t forget to get out of the way once the fuse is lit. Nah, but I like Cat’s observation that one of these meatheads (Zach… maybe Caleb) may blow their foot off! Looking at the pic above i can almost feel sorry for Caleb…..almost. I really wouldn’t want anyone to get hurt emotionally in this game. Even Caleb. He’s immature where women are concerned. Maybe in his hometown he’s considered a “good catch”. Or more likely….he over rates himself in the boyfriend category. His ego is massive. What worries me is what will happen when or if Amber latches onto Cody. It’s like they’re fighting over the same toy at the playground. I expect some crap talking about each other. 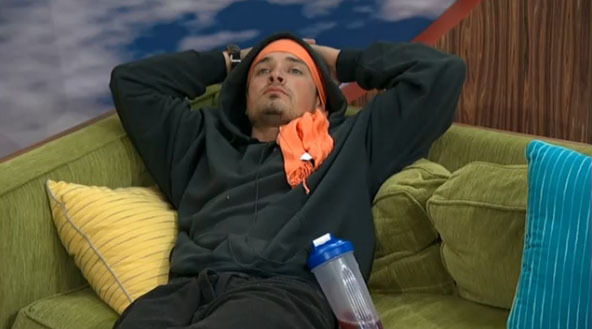 And Caleb to be evicted when it gets to be too much for him. I agree Cat, sitting there like a dud with her scarf on his head. Seriously dude, get out and play the game. the scarf drives me up the wall. ugh. Anyway, I won’t bore you with comments after everyone here, but a couple of observations: First, I think things are going to settle in much more after Devin leaves; it’s started already. Second, I think alliances are forming all over the place because – like us out here – the hgs inside actually like each other too but the paranoia keeps them from deciding who to trust or align with. I’ve never seen so many alliances…! Third, I’m reeeeeally worried for Cody (and the alliance with Derrick, which I think is a good one). Because if Caleb doesn’t leave, the Amber situation is gonna blow up eventually. But when Caleb DOES leave, Cody and Amber may start a showmance. Nicole is smart enough to avoid one, but Amber is not. In fact, she’s the type who is used to using her looks to get what she wants from guys. She appears to be attracted to Cody, and she WILL milk that, especially after Caleb isn’t a threat. And blind. Why’s his hair so fluffy? Lol..are you talking about Cody or Zach? Cody, but Zach has very fluffy hair too. I’ve seen that one and gross, I’m just not interested. Half naked men really don’t get me going. HAHA!!! Your comment must await moderation, Kesha. Quit causing trouble. I saw those knuckleheads taking pictures underwater yesterday. Is that what you’re talking about? Sheesh. Boys! Nope, the pic of a half naked Cody modeling….well i’m not sure what he’s modeling unless it’s jock straps…and nothing else. Now BB is starting so see all of you later! You can’t fix (stupid) Aubies! Teehee! So true, Lilly! Glad you both liked it. Of course, when I was at UT Austin, I told it as a Longhorn and Aggie joke. It works for all those great rivalries–I was kinda sad to see the Texas-Texas A&M games end–they were such fun to attend, especially since Texas won both years I was in grad school there! I needed it myself–I am still misty-eyed with a lump in my throat after watching Donny tonight. He is simply a superior human being and I hope he can continue playing his own game. Nope, me either. I go by the actual person, their personality. Did anyone know that Caleb, Colton’s boyfriend from survivor blood vs water died in a train wreck? How sad! Yes T-bird I think that Cat and Todd posted that last month. It is sad very sad. Just a curious observation but Victoria follows Ariana Grande on Instagram. The only thing that keeps me from thinking she’s onto Frankies secret is the fact that i don’t think she could keep it to herself if she was suspecting. But then her little Q&A with Frankie the other night left me wondering. Yeah, I was assuming she caught on as well. But she does seem like the type to spill the beans to at least one person. It could be fear keeping her from mentioning it. She’s afraid of her own shadow. But i do think she has an inkling. Maybe not full out suspicion but something is clicking in her head…and no its not the rocks. Victoria is just not that astute, IMO. If Christine were a follower of Ariana, she might have put two-and-two together in that conversation–or she might have at least wondered what Frankie was hiding. I honestly think Victoria was just stubbornly controlling the conversation the other day. She noticed that Frankie jumped from discussing his sister, but she’s just not sharp enough to give that any value other than Frankie not answering her questions to her satisfaction. I’m not completely convinced that she doesn’t know. If she keeps asking questions them i’m sure she knows. Have you heard her mention it again? I haven’t – which is another indicator she didn’t really think much more than “wonder why he didn’t answer my question?”. I agree, though, that time will tell – if she asks more questions, or if she shares here suspicions. She absolutely cannot keep her mouth shut, especially if she thinks she has some good gossip. She’s actually on quite a few radar screens. For the exact same reasons you mentioned. All of them think she is an “air head”. And i have to admit….there’s enough space up there to build a condo. LOL, Cat, you have a wicked sense of humour.